What New Car Is Truly A Sleeper? A sleeper, or Q-ship, is a vehicle capable of high-performance but doesn't let on with flashy graphics or bodywork. What new car is truly a sleeper? As much as we like the 2010 Ford Taurus SHO, the nickel-finished wheels sort of undo the understated performance look of the original two generations. 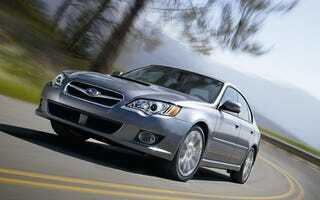 This is why we're picking the Subaru Legacy GT. Just take one look at the Legacy and, likely, you'll look away. In a sea of mid-size sedans it blends in well, giving no hint of the 243 stealthy turbocharged horsies lurking under the hood. And unlike most FWD sedans, the Legacy's AWD system and tight chassis means it can keep up with sportier cars in the twisty bits. Throw in a manual transmission, avoid the Spec.B options and wow your friends with what is essentially a WRX for adults. 2010 Ford Taurus SHO: The Sleeper Awakens!